Signed l.l., "EV Luminais". Not dated. 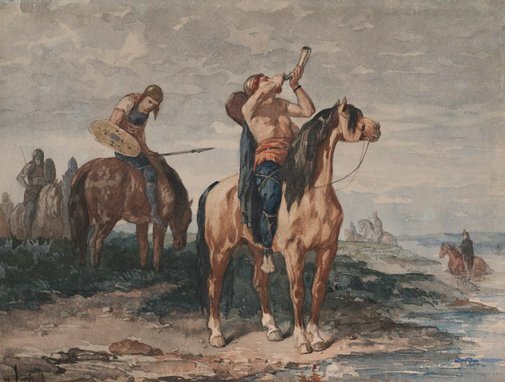 Victorian watercolours from the Art Gallery of New South Wales , Sydney, 2017, pp 134–35, col illus p 135. National Art Gallery of New South Wales illustrated catalogue , Sydney, 1928, p 116, no 157. Revised edition 1926. National Art Gallery of New South Wales illustrated catalogue , Sydney, 1925, p 85, no 54. National Art Gallery of NSW illustrated catalogue , Sydney, 1924, p 84, no 57. National Art Gallery of NSW illustrated catalogue , Sydney, 1921, p 71, no 57. National Art Gallery of NSW illustrated catalogue , Sydney, 1917, p 68, no 14. Revised editions 1918, 1919. National Art Gallery of NSW illustrated catalogue , Sydney, 1906, p 71, no 17. Revised editions 1908, 1910, 1912. Catalogue of the National Art Gallery of New South Wales, published by the Trustees , Sydney, 1899, p 56, no 350. Catalogue of the National Art Gallery of New South Wales (with illustrations) drawn by E L Montefiore, director, and others, published by sanction of the Trustees , Sydney, 1893, p 82, no 232. Catalogue of the National Art Gallery of New South Wales, (with illustrations), drawn by E L Montefiore, Esq (President of Trustees) and others, published by sanction of the Trustees , Sydney, 1891, p 90, no 360. Catalogue of the National Art Gallery of New South Wales, with illustrations, drawn by E L Montefiore, Esq, published by sanction of the Trustees , Sydney, 1886, p 56, no 68. Catalogue of the National Art Gallery of New South Wales, with illustrations, drawn by E L Montefiore, Esq, published by sanction of the Trustees , Sydney, 1884, p 53, no 72. Trustees of the Art Gallery of New South Wales: Minutes 31.8.1880-4.8.1891 , Sydney, 1880-1891, p 193 (5 May 1884).